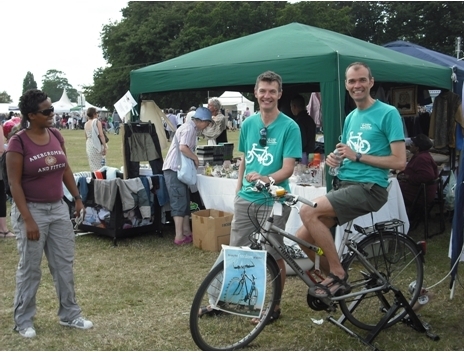 Bike Week takes place across the UK from Saturday 18 to Sunday 26 June 2011. In Lambeth we have arranged events through the week. All events are leisurely rides and suitable for everyone. For other events across London and the UK see the Bike Week website http://www.bikeweek.org.uk/. We will be starting events off on Tuesday 14 June when we will be holding a Bike Breakfast 7:30 – 9:30am at the Lambeth Accord Building, 336 Brixton Road, SW9. Call in for coffee, tea, pastries and other goodies as well as free a Dr Bike session at which you can get your bike checked and minor problems mended. A leisurely ride along the riverside from Clapham to Richmond Park followed by lunch in the Park. The ride will set off from Myatts Fields Park and the barbecue will be held nearby from approximately 5pm onwards. Meet 1pm at the entrance to Myatts Fields Park, corner of Knatchbull Road and Calais Street, SE5 or contact Luke Evans (lseevans@yahoo.co.uk/ 07973 786015) for details of the barbecue. Our regular meeting with, we hope, special guests for Bike Week! Come and watch a fascinating cycling related film (to be confirmed nearer the time) in a pub! Join us for a day long look at the architecture of Norman Shaw including Bedford Park, Britain’s first garden suburb, in West London, New Scotland Yard in Westminster and many other buildings around central London. Details of the ride and the starting point were yet to be confirmed - look out on our website and email group nearer the time. We are working with Lambeth on this fantastic all day ride event rounding off Bike Week which will allow you to discover more about your borough. Pick up a passport from one of four vibrant hubs and navigate the route around the sites of Lambeth on foot or by bike collecting stamps along the way and spotting the specially placed bikes to win prizes. Absolutely everybody is welcome and can ride with colleagues, family or friends, for fun or for charity. More information at www.biketheborough.co.uk. Lambeth are also looking, for volunteers to lead rides and marshal the route on the day – to find out more please contact eduval@lambeth.gov.uk or call 020 7926 0677 or contact Lambeth Cyclists. The 1890s and 1900s were a boom time, with the wealth of Empire and industry flowing into Britain. In London this brought about a frenzy of building and re-building. In these heady times architects threw off the earnestness of the Victorian "battle of the styles" and cheerfully pillaged every architectural style, old and new, to satisfy their clients' love of luxury and ostentation. 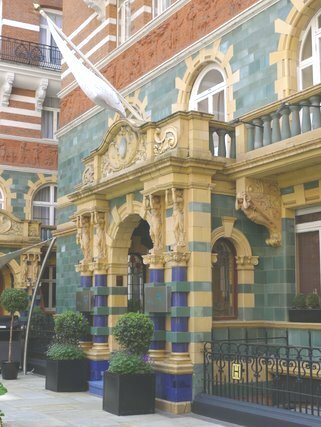 Extravagant, inventive, whimsical and vulgar, in Edwardian architecture bling is writ large. We'll explore its dazzle in pubs, offices, hotels, churches, shops, stations, theatres, memorials, mansion flats and private houses. Ride led by Tom Bogdanowicz and Mark Knox. work or regularly use either of these streets, please take time to respond. 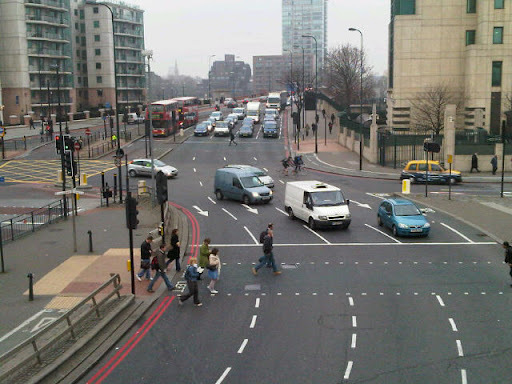 You can send in your thoughts via the online survey at http://www.cityoflondon.gov.uk/fers/. 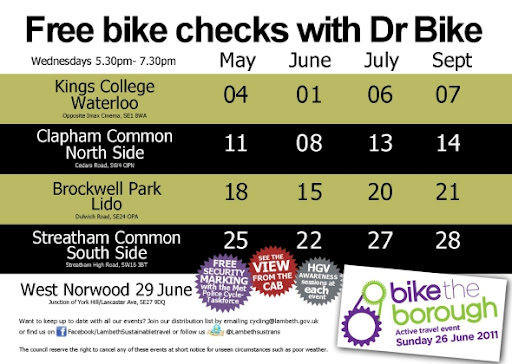 Lambeth will be running free Dr Bike bike checks every Wednesday 5:30-7:30pm throughout May 2011. See below for a list of dates and locations for this free service.